Who’s who at the zoo? Take a virtual field trip with our vocabulary lesson on Zoo Animals! 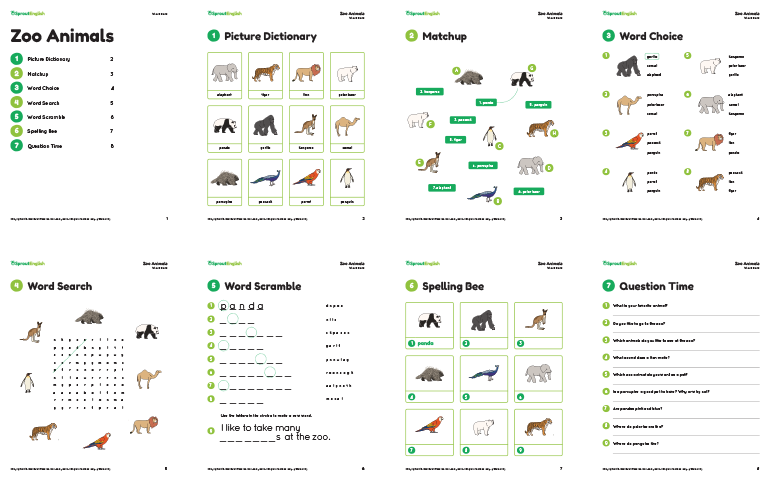 In this eight-page Word Bank lesson, students will learn about common zoo animals from around the world. This lesson includes a picture dictionary, matchup, word choice, word search, word scramble, and spelling bee. Your young learners can also practice using the vocab in context with our discussion questions exercise. For more animals you might find at the zoo, check out our related resources list below! The zoo animal images are also available as flashcards at the end of the lesson. Check out 9 Ways to Use Cards & Flashcards in Class for ideas on using animal flashcards.